Reverse card includes Buzzboy advertisment. See also MORE FUND COMICS #1 and MORE FUND COMICS #1 (LIMITED EDITION). I attached a copy of the program and George doing sketches for fans on Friday and George on the JLA/AVENGERS Panel (himself) Sunday. At the end of the panel he talked about his work for the CBLDF and the More Fund Comics issue that will be available in September at Baltimore. George Sketched for Make-a-Wish Foundation and raised over 2,500 dollars for them. My tape recorder is playing back the panel discussion in super slow speed so until I can't figure it out and I can't transcribe it. Lots of cool info to tell you though about what Mr. Perez told us to at the panel. No plot points but about some cool scenes. One rumor I can shot down right now is Big Belly Burger is not Mr. Kurt Busiek. George Perez. Geoff Johns. John Romita. Adam Hughes. Michael Oeming. Terry Dodson. Erik Larsen. These are just a few of the many top-name creators contributing to MORE FUND COMICS, a star-spangled anthology benefiting the Comic Book Legal Defense Fund, and debuting in September at the Baltimore Comicon. Featuring a stunning Incredible Hulk cover by George Perez, the book will contain stories, pin-ups, and introduce a special feature: "The CBLDF Sketchbook," featuring a glimpse into the sketchbooks of some of comic's hottest artists. Some of the other contributors to the book include: John Romita, Jr., Erik Larsen, Frank Cho, Art Adams, J. Scott Campbell, Butch Guice, Geoff Johns, Skott Kolins, Brandon Peterson, Scott Kurtz, Jerry Ordway, Paul Grist, Scott Morse, Jim Valentino, Hi-Fi Studios, Mike Manley, Michael T. Gilbert, Mark Wheatley, Jimmy Palmiotti, Greg Horn, Stan Sakai, Mike Oeming, Chris Eliopoulos, Ben Dunn, Terry Dodson, Ron Marz, Mark Schultz, Adam Hughes, Rick Remender, Steve Conley, and many more. "The goal of this book," said publisher/editor John Gallagher," is to bring together the big and rising stars of comics, let them do something completely different, and raise awareness and bucks for the CBLDF." Completely different? "Let's just say that John Romita will be doing something he's never done before." 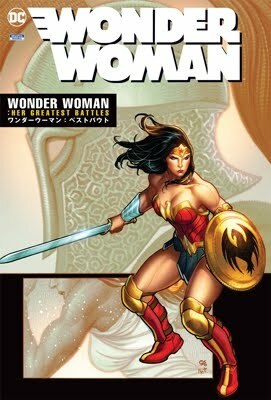 The same goes for Geoff Johns and Skott Kolins (JSA, Flash), Mark Wheatley (Hammer of the Gods), and even MORE FUND's co-conceiver, Frank (Liberty Meadows) Cho, has something new: "Scott (PVP) Kurtz and I will be debuting a new top secret project in the very pages of this anthology book," said Cho, "a brand new ongoing humor series." MORE FUND was conceived by Gallagher (best known for his work on the self-published Buzzboy), Cho, and Baltimore Comicon organizer Marc Nathan, as the three tried to think up a new way to help the CBLDF. Cho and Nathan went about securing mainstream creators like Campbell, Adams, and cover artist Perez, while Gallagher focused on pulling in some of the up-and-comers contributing, such as Carla Speed McNeil, J. Bone, and Scott Morse. Then CBLDF Executive Director Charles Brownstein, a big supporter of the project from the start, pulled out the big guns: He got Marvel Comics to give permission to use the Hulk on the cover. Commented Nathan,"Once Charlie got us the Hulk, we knew this would be big." You can find out how big in September! More Fund Comics is a 144-page trade paperback, retailing for $10.00. Published by Sky Dog Press, look for an advance solicitation under the CBLDF banner in the June edition of Diamond's Previews. Also from Sky Dog in the June Previews, look for "Buzzboy: Monsters, Dreams, & Milkshakes," the new trade paperback by John Gallagher and friends, shipping in August. MORE FUND contributors are being added every day, and the growing list and preview art can be checked at www.skydogcomics.com. MORE FUND COMICS IS COMING! Sky Dog Press, publisher of Buzzboy, has joined forces with the Baltimore Comicon, and a variety of awesome comic creators to bring you MORE FUND, an all-ages anthology book to benefit the Comic Book Legal Defense Fund! Featuring a HULK cover (courtesy of the fine folks at Marvel!) by JLA/Avengers artist George Perez! Featuring a mix of stories, sketches, and pin-ups, his star-studded book debuts in Baltimore in September-- Look for an advance solicitation in Diamond's June Previews, under the CBLDF banner!! Featuring an assortment of big name creators and rising stars, MORE FUND COMICS is sure to be a hit! Well, what did I find in my inbox but a very similar picture. It seems that Marvel have approved the CBLDF using Hulk on the front cover of this book. This September, I will only attend the Baltimore Comic Con and NOT the SPX (Small Press Expo). It was a tough decision but due to the overwhelming workload and commitments, I can only attend one convention that month. So those in the Washington, Virginia and Baltimore area, if you want my autograph or a sketch come on down to the Baltimore Comic Con. The Baltimore Comic Con is printing a huge anthology book to benefit the COMIC BOOK LEGAL DEFENSE FUND. For those who don't know, the CBLDF is a non-profit organization dedicated to the preservation of First Amendment rights for members of the comics community. The anthology book (entitled MORE FUND COMICS) will feature a stunning cover by the great GEORGE PEREZ and contributions by ADAM HUGHES, ARTHUR ADAMS, BRANDON PETERSON, BEN DUNN, BUDD ROOT, BUTCH GUICE, DAN FRAGA, ERIK LARSEN, GREG HORN, J. SCOTT CAMPBELL, JIMMY PALMIOTTI, JOHN ROMITA, JOHN ROMITA JR, MARK SCHULTZ, MIKE OEMING, PHIL NOTO, STAN SAKAI, TERRY DODSON, and many more. COMING SOON! COME BACK TUESDAY, APRIL 15 For The Big Scoop!